We wind along Laundry Lake, and when our driver explains that it derived its name from the laundry outlet on its shore, the only one in all of Jasper, my mind darts back to the Ganga and pictures scenes of it being used as one big laundry stop. We make a quick stop at a waterfall, and hearing it roar through an ancient canyon sends a chill down my spine. 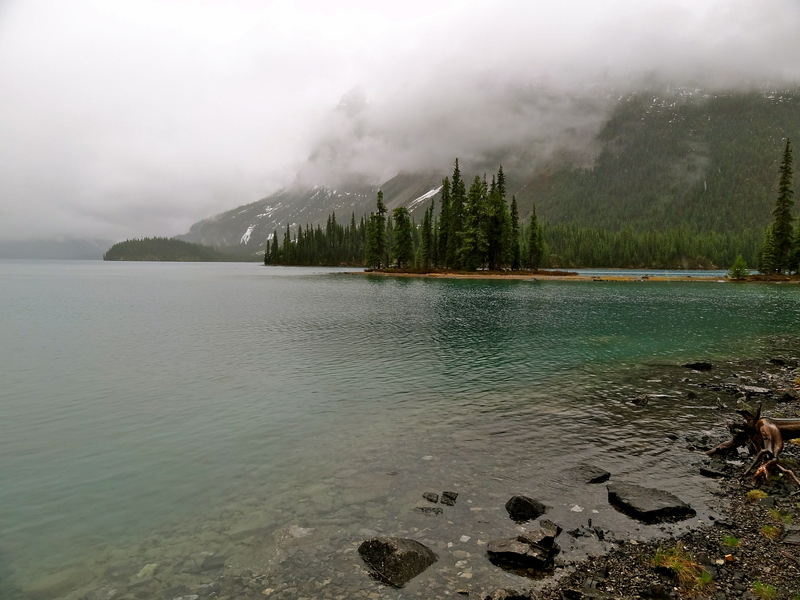 On the shores of Maligne Lake, cobalt blue waters stretch before me. I imagine them wrapped in snow just a day ago, and marvel at science for figuring out how white glacial snow can, almost magically, turn to calm blue water. On board the boat, I step into the open deck and let what is now a light pitter-patter, fall on my face. As we zoom along, I do a mini “Titanic” in the cold breeze and feel like I’m flying into the mist that engulfs the shore! The cobalt blue waters of Maligne Lake. When we finally arrive, Spirit Island turns out not to be the big, empty stretch of land that I had imagined, where locals would picnic during the day or camp at night with a barbecue. Or anything that I could have imagined. A narrow piece of land juts into the calm waters of the lake, elongating into a perfect oval shape. 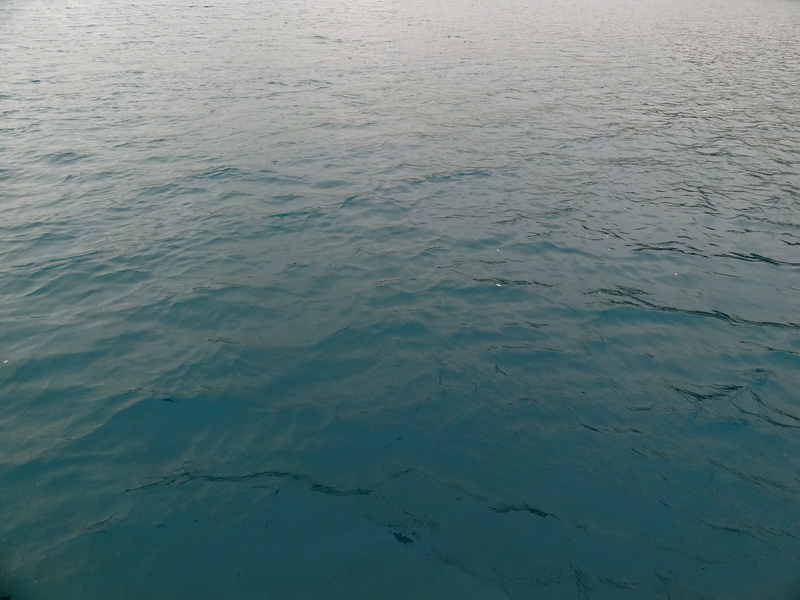 It resembles the form of a person peacefully at rest, though awfully lonely in the middle of this vast blue expanse. A handful of pine trees stand in its centre, and line the shore all along. Beyond them lies a faint outline of the Rockies, enveloped by the mist. The boat pulls over, and I step off in awe, carefully treading on the wooden jetty to the shore, almost afraid of stirring the serenity that surrounds me. I follow the demarcated trails along the periphery of the forested shore, and find myself gaping each time I catch a glimpse of the surreal mass of land that sits before me. 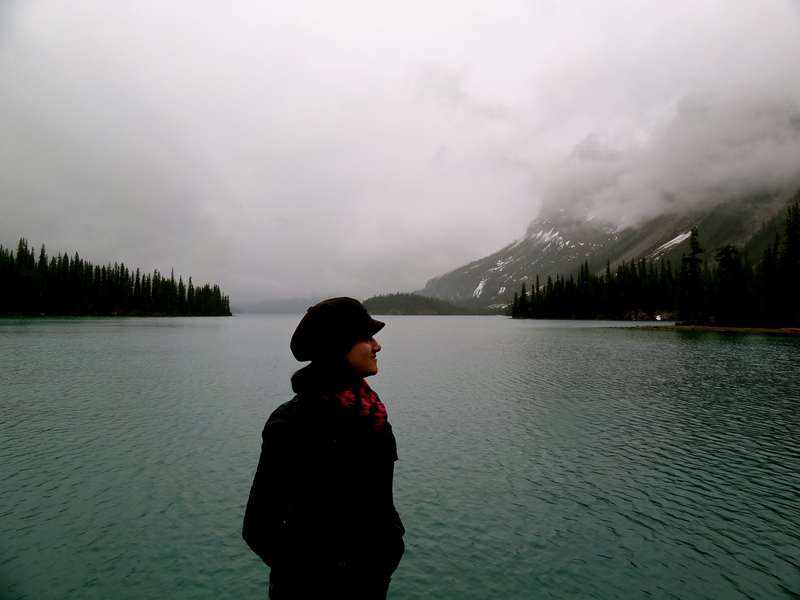 The serenity of Maligne Lake. No one knows how Spirit Island got its name. Some suggest that it was given by the first person who photographed it. Others that it was a love story; girl meets boy secretly on the island, they fall in love, girl confesses the affair to her father, father forbids girl from going to the island, boy dies waiting for her on the spot they first met, boy’s spirit is Spirit Island. Despite my affinity for tragic stories, I find myself hoping it is the former. I would later find out that Spirit Island is one of the most photographed spots in the Rocky mountains. But not for me. For I see no mountains, no peaks covered in snow, no blue skies. The clouds that drape the Rockies slowly descend upon me too, and engulf my spirit, as though reading my mind: Can’t I stay here forever? Who wouldn’t want to stay here forever? Would you like to visit Spirit Island? Or does it remind you of any place you’ve visited before? Maligne Lake is a scenic one hour drive from the town of Jasper. 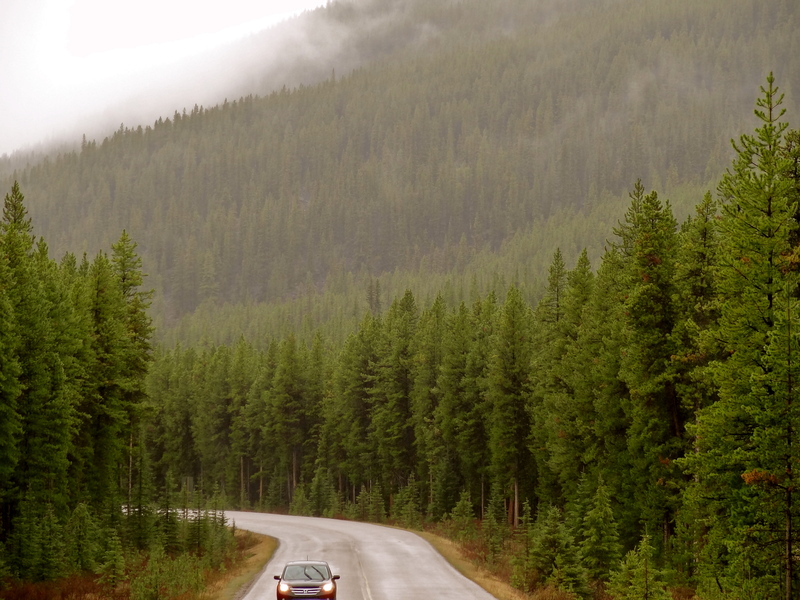 (All drives in Jasper are scenic). Glass boats take 45 minutes to reach Spirit Island, and let you wander around for 15-20 minutes, before the 45 minute journey back. The bakery at Maligne Lake serves delicious muffins and cookies, and it’s a good idea to stock up for the ride. 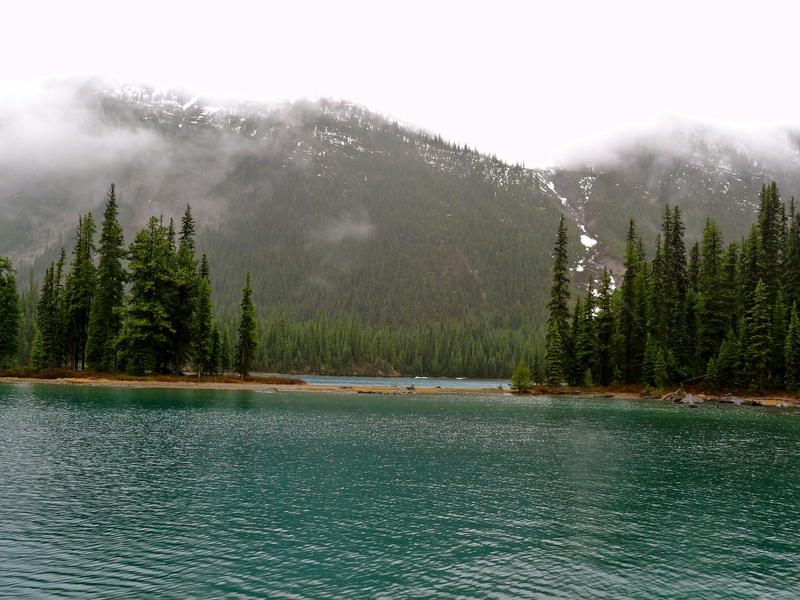 I took this cruise with Maligne Adventures, as organized by the Canadian Tourism Commission and Tourism Jasper, and loved it. Follow my adventures across Canada virtually on Facebook, Twitter and Instagram. Or on our blogger train’s Tumblr. Thanks Satyender, glad you liked them. looks like heaven of my dreams…lovely description…. It was a piece of heaven, undoubtedly! This place is so virgin 🙂 Makes me want to speed up my work to inspire people to travel. It reminds me of ‘Willen Lake’ in Milton Keynes near London which I visited once as the snow was melting away. I would live here forever. There also people created such stories kya? //* Though reading my mind: Can’t I stay here forever? * // this line, exactly i doubt before i finish off. you wont. Yes, you are a travel bird. again and again pictures distracting me a lot, not letting me to read. If u don’t mind i l share it too! Haha, love stories are everywhere 😉 You’re right, I would want to fly away sooner than later. But who knows, right? Worked there? Wow. I’m seriously jealous, James. That must’ve been a fantastic experience! The rain definitely lent it a more mysterious aura. Would love to go back on a clear day though! Lovely piece – really enjoyed reading it. Look forward to reading your other posts from your cross Canada trip. Hello again Shivya, how are you? That looks like my kind of place! I’ve been to the Rockies but much further south in Colorado. Would love to see Canada though. Hi Pete! Good to see you here again 🙂 I haven’t see the ‘other’ side of the Rockies yet, but the Canadian side sure is beautiful. I think you’ll love Spirit Island, it was just so breathtaking. 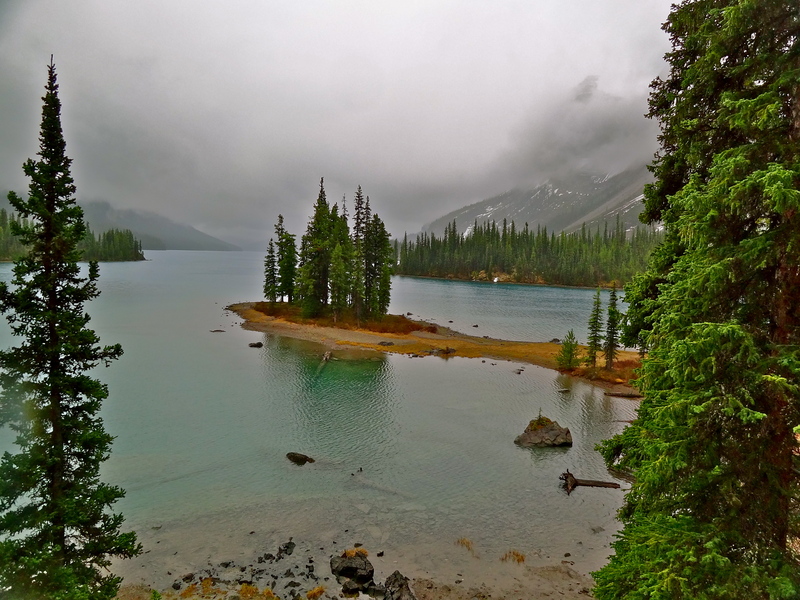 I immediately regretted not visiting Maligne Lake or Spirit Island once you had all left to go there. Reading this, I feel like I’m there after all, seeing it through your eyes. Your writing is so vivid and descriptive, Shivya. I’m so glad we met and I now know your work and can follow your travel journeys. A lovely piece of writing. As always…wonderful to read and do a virtual visit via your pics and words…all the time wondering when can I make it!! 🙂 Just a qsn…do you while on a visit experience it and later put down the words….or is it a simultaneous thing happening, i.e. yo jot down words /feelings as you experience them …. I usually just try to experience the place and later revisit my thoughts to write about it. Unless there’s a really overpowering thought that I think I’d want to remember – in which case, I scribble it on my phone. Previous Post12 Reasons to Love Jasper. Next Post#WeGoSolo Contest: Your Dream Solo Travel Destination!